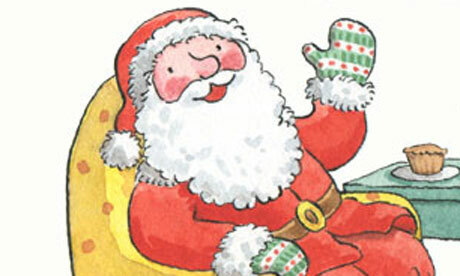 Click on Santa to learn to draw him. Thanks to Hilary Jones for pointing out Download Neuroscience Commentary FINAL (1)from the Teaching and Learning Research Project. Many of the leaders in the field have contributed to it, and it has some of the best diagrams of brain cells and connections that I've seen. The sections on the influence of caffeine (negative) and of sleep (positive) on brain functioning and learning are most informative, particularly the diagrams showing that, as we sleep, we appear to repeat the mental processes we were going through when awake, so in effect adding unconscious practice. The paper also notes, in the context of brain gym, that, while dehydration inhibits thinking, so does drinking water when one is not thirsty. "This type of pattern recognition approach is a very exciting scientific tool for investigating how and where knowledge is represented in the brain," says Zoe Woodhead at University College London, who wasn't involved in the study. "Words that mean the same thing in different languages activate the same set of neurons encoding that concept, regardless of the fact that the two words look and sound completely different." This reinforces the idea that new languages are not learned from scratch, but are grafted onto structures that have developed in the brain as we learn our first language. It is, therefore, not merely sensible but important to bring all of a person's intellectual capacity to bear in the task of learning the new language, including their ability to relate patterns in sounds and meaning to patterns in letters. These patterns vary with each new language, and reflect the culture of the speakers as much as the rules of their grammar. French is the most obvious example. French people like their spoken language to flow freely, with mild variations in intonation that are far removed from those of English, and farther still from those of German. Consonants are not allowed to get in the way of flow, and when they do, they are simply not pronounced. Jerky vowels are simply banished. Written language must be precise and unambiguous (except, of course, when the French wish to be so). So, written French ties up gender, tense and sentence organisation much more tightly than English, and often with word endings that are not pronounced, so that to understand a verb or group of words, we need to understand grammar as well as sound. This is the true hidden agenda of French. Once it is understood, its patterns are reasonably regular and predictable, and a pleasure to use. Unless it is understood, French comes with tears. Piano practice, how slow is slow? Sir Thomas Allen takes care to ensure that everyone who wants to hear him can do so, and peforms to the same standard in a school hall as at the Royal Opera House. Last weekend he was at St Christopher's hospice in Sydenham, and the person sitting next to me happened to be a professional pianist. I mentioned to her that I was having trouble practising slowly enough, and she said that she also had to practice extremely slowly, sometimes even stopping with her hands in the correct position when she had to play difficult pieces. Patrick has told me something between 500 and 1,000 times that I go too quickly, and this is probably going to prevent me from playing as I would like to unless I can stop it. As soon as I manage to play part of a piece properly, I tend to speed up on that part, creating uneveness. Following this conversation with my kind neighbour, I've moved to seeing how slowly I can manage to play, with the idea of getting all of the information from the score into my mind without the pressure that leads to jerky playing. It seems to be working - my Mozart sonata is a little better, and I'm playing things by Fanny Waterman, who puts pianistic technique into the simplest pieces, with more confidence. Catherine Edwards' lovely new recording of Stanford's music for violin and piano ls here. Evening Standard Reading Campaign - punch the air! Two clips on behaviour - Bill Rogers, Ruth Miskin and the alternative to good discipline. Bill Rogers uses the politically correct term "challenging" for a poorly behaved class that is out of control. His first approach is to "get the teacher out of there" by saying there is a message for them at the office, and then finding ways of rebuilding the teacher's relationship with the class. Giving the teacher the authority to order an immediate two-hour detention for anyone misbehaving might be a more sensible alternative. Two hours is a long time. Ruth Miskin offers five principles - passion, participation, (focused) praise, pace (lively, no down time), purpose (teachers need to be clear on what they are doing, and adapt teaching style and method to it.) Ruth Miskin is working with younger children rather than adolescents, but her principles integrate each element of effective teaching into the approach on behaviour. In the secondary context, Ark academies' approach benefits from its use of assessment to ensure that pupils are given the right work. Clicking on either of these links will bring up a series of clips on behaviour, many of which are worth watching for different reasons. English Teacher Going Mad shows what can happen, and shouldn't. Even in the days of Sir Humphry, the MoD was a by-word for out and out lying, and its treatment of Sergeant Nightingale, freed after an unjust court martial - plead guilty and you'll get off light - showed the danger of state regulation of the press. A D-notice is a device intended to prevent the publication of information dangerous to national security, and one was issued to the Telegraph in respect of this case, that involved no issue of national security whatsoever. This is reminiscent of the Kremlin's use of insanity laws to lock up its opponents, though I suppose it does stop short of the assassination currently practised in some countries. It's a good job the MoD could not enforce its D-Notice. 1. Have children form "writing partnerships" and check each other's work, with guidance on what to look for, before they hand it in. This helps them pay attention to detail, and it's always easier to spot someone else's error than our own. Five minutes on this saves a lot of time. 2. Make sure children have time to reflect on marking when you give books back, so that they don't ignore what you say. Use partnerships for this again where appropriate. Have children do corrections, and set their own targets. Second, Lord Adonis has had the good sense to denounce "Dr Sir Les" Ebdon as unfit for his post, and to call for him to hand his job to someone else. Professor Ebdon is a respected chemist. He should stick to what he's good at instead of peddling sub-standard degrees and calling anyone who disagrees with him a snob. Snobbery and intellect are two different things.